It's no surprise that Te Anau is a mecca for chefs because we have arguably the world's best wild food here, grown in a pristine environment. We are famed for our wild venison and our crayfish (often called lobster). Our venison is so famous it is shipped all over the world, and our crayfish at the highest quality in the world and also get munched all over the globe. The intimate Redciff Cafe on Mokonui Street near the lake front (opposite Lions Park has an unrivalled reputation for high-class food and regularly wins awards. Confusingly it's definitely not a cafe. It's a restaurant (with bar and gig activities on the side, and a great garden out the back). It is one of only three restaurants in New Zealand to be awarded the Trip Advisor Travellers' Choice title. It is great for romantic dinners and can also cater for larger groups such as birthday parties. The Fat Duck is at the end of the main street furthest from the lake. It is a relaxed dining experience and has a wide menu and large premises and a giant TV screen; you can guarantee the TV will be on if there is an important sporting event featuring New Zealand teams. It's the perfect venue for casual lunches, dinner and get-together parties. It's food is filling and fresh. The Olive Tree Cafe & Restaurant looks and feels like a cafe but it is most definitely also a restaurant. it has a great menu for lunch and dinner and is down a short alley off the main street near the lake front. There is also some fabulous dining available in our hotels. 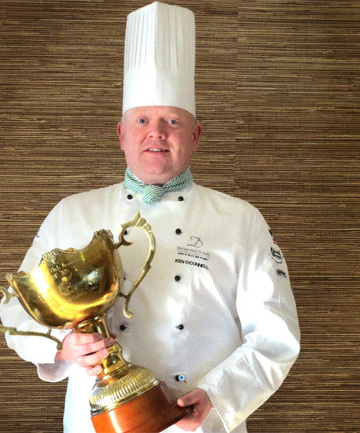 In fact, Te Anau is home of Ken O-Connell (pictured right), New Zealand's famous Chef of the Year who works at the Distinction Te Anau Hotel & Villas on the lake front in Te Anau.